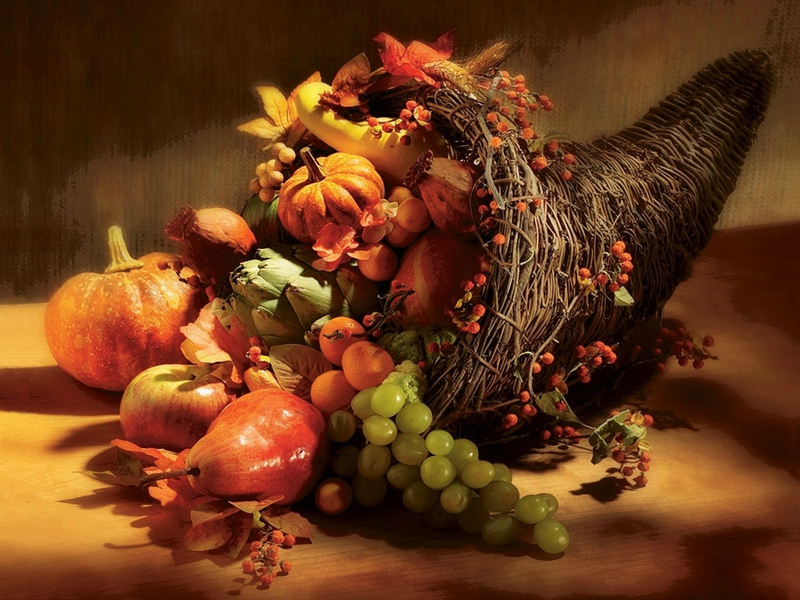 You know, I’m sorry to admit that when I see a cornucopia, AKA horn of plenty, I usually just think of cheesy Thanksgiving cards and decorations. And yet, when I really think about the ancient symbol, I realize that there’s a lot of useful meaning to be derived from it. It is a reminder of the bounty in our lives, for which we give thanks on Thanksgiving. As nice as the image is, sadly the magic cornucopia of Greco-Roman mythology, that provides an endless supply of food, doesn’t really exist. And so, it is a reminder, conversely, of the millions of people who have little to no bounty in their lives, that we might do something, no matter how small, for them. It’s notable that the horn of plenty is overflowing with fruits and vegetables, rather than iPhones, sports cars, and bling. Thinking again of those who lack bounty, it’s humbling to consider how many of them would be utterly satisfied with abundant fruits and vegetables. I, indeed, have much to be thankful for. Family, friends, food, clothing, shelter, etc. It’s been a while since I’ve written in appreciation of all the people who take a moment to visit, to read, to click on the Like button, to leave a comment, or to choose to Follow the blog. As I’ve written in the past, I don’t make any money from Fish & Bicycles, I work a 40+ hour per week job, and I have time-consuming responsibilities to my family and my home. Therefore, I don’t have the time to respond to everyone who Likes one of my posts or chooses to subscribe, even though I am incredibly grateful for every.single.instance. So, thank you, dear readers! Sincerely! I’ll leave you with some links to my previous Thanksgiving posts, ghosts of Thanksgivings past, so to speak. We are lucky to have so much to give thanks for! Happy Thanksgiving to you! Thanks, Anita! I hope you had a wonderful Thanksgiving as well! Thanks, Pit! And I hope you had a great Thanksgiving too! Following your blog has been both fun and thought provoking.. Thank you ! Thanks, Helen! You know I love your blog as well! Thank you for continuing to blog about and find entertaining, beautiful, thoughtful and of course funny content for us to enjoy. It is a challenge to both keep up on reading and writing blogs and your blog is very much appreciated. Thanks, SO much, Tom, for checking in when you can and doing so in such a thoughtful manner. I really appreciate you, too!